I never thought I'd install aftermarket body parts on my car. Simply not my thing. But I simply couldn't get away from the fact that my car was beginning to look a bit dated. 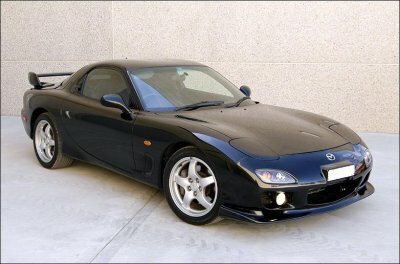 Mazda had already taken the step to freshen up the design with an overhaul in 1999. New front bumper, new rear wing, different style wheels, etc. And there was something to be said about the new front bumper. From an engineering perspective it was a step above the old style. The larger openings made for better cooling in all regards - oil coolers, radiator, and intercooler all were fed more air. From an aesethic perspective there was much controversy. Seems as if most people really liked the new look but the integrated license plate frame was a real eyesore. I was of the same opinion. I never have used a front license plate on my car, and never will, and having an unused molded in plate holder stuck right in the middle of the front bumper simply would not do. So scratch that option. Rats. 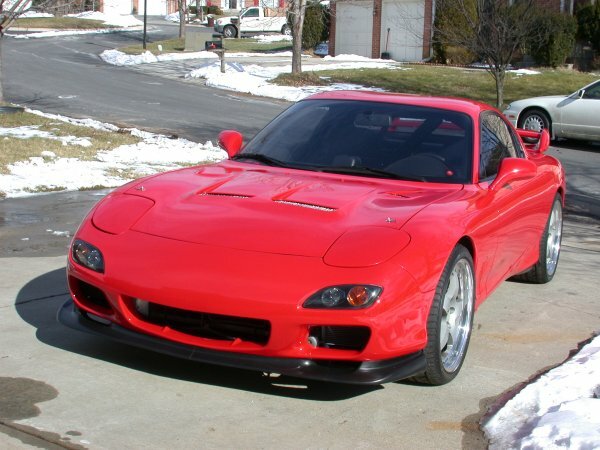 Lovely 1999 JDM RX-7 but...OUCH! That license plate frame has to go! THE PLOT THICKENS For years people moaned and groaned about that license plate frame holder. 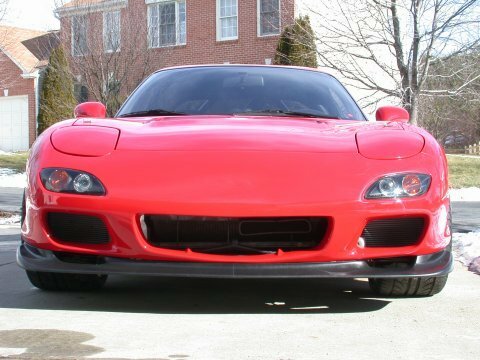 Some folks took it upon themselves to buy the OEM '99 bumper and have a body shop shave the plate frame off the bumper and graft in a cover. This is a time consuming and costly option. A well known vendor developed a fiberglass version of the '99 bumper without the license plate frame. VERY nice but still made of fiberglass. 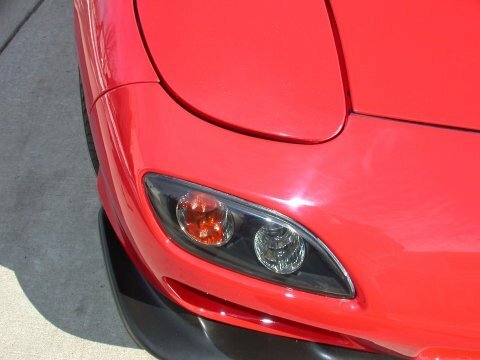 Fiberglass is brittle and very easily damaged and in my opinion not the best idea for a front bumper unless you plan on frequent repairs. 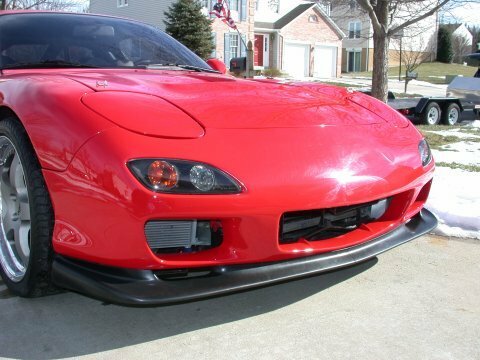 Fast forward to the summer of 2004 and an enterprising gentleman decided to get the ball rolling and persuaded Rotary Extreme to produce a urethane 1999 style front bumper with the license plate frame removed. Yippeee! This essentially addressed all my concerns at least. Made of urethane like the OEM bumper so wouldn't be easily damaged, didn't have that eyesore of a front license plate frame, was produced in the US, and hopefully would be affordable. The affordable part was satsified as this proposed product generated such interest a group buy was orchestrated and the price dropped significantly. It goes without saying I jumped aboard the ship (as did 4 more of my DC friends) and about 6 months later a huge box arrived at my house. 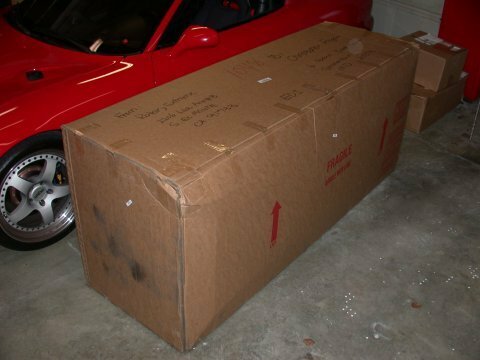 The biggest box I've ever received! 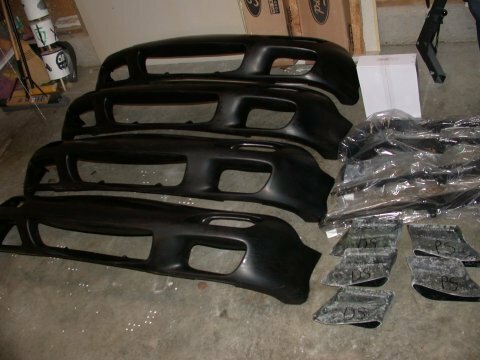 4 bumpers and the accessories our locals ordered. TECHNICAL ISSUES Replacing the front bumper with another part is not a one for one parts swap. Several other things need to be considered. The turn signal lenses are different so replacements must also be purchased. The OEM 1999 lenses are VERY expensive at more than $400 for the pair. Yikes! AND...they will not plug into the 1993-1995 wiring harness. An adapter harness has to be bought for about $80 (more expense) or you could splice in the wires yourself (more work). However, help is on the way. Makoto Auto Trends sells knockoff 1999 JDM style lenses for 1/2 the price of the factory lenses (Part number M-MZ99R7-6839BLX for the smoked version) AND the wiring plugs directly into the 1993-1995 harness - no adapter or wire splicing needed. The only difference in appearence is the OEM lights have a smooth inner housing whereas the knockoffs have an angular inner housing. From 5 feet you can't tell the difference and if you didn't know there was a difference one would swear they were OEM parts. And a nice option is the knockoffs are sold with a clear lens, a smoked lens, or clear lens with a clear housing (vs black). I chose the black housing with the smoked lens. The next hurdle involves the oil cooler ducting. 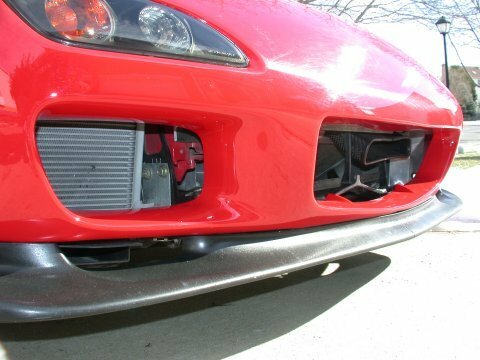 The 1999 style bumper obviously has larger oil cooler openings. This renders the existing oil cooler ducts unusable. Add to this my aftermarket CWR oil coolers and my nice Carbon Fiber ducts for those are also unusable. Fiddlesticks! Rotary Extreme has developed a fiberglass duct to fit the 1999 style bumper and which mates to the EOM oil coolers both drivers and passenger sides. Doesn't really help me much so I have resigned myslef to fabrication of my own ducts or persuading CWR to do a run of some CF ducts for the '99 bumper. 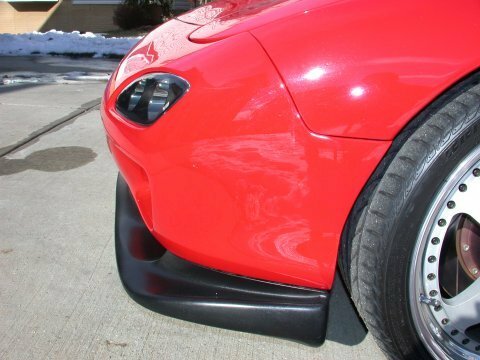 And the last issue is that of the lip spoiler. 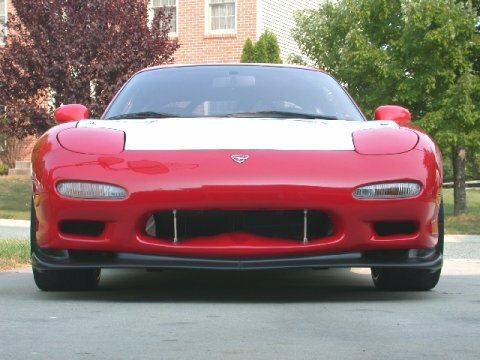 I already had the 1999 lip spoiler installed on my old bumper so no problem for me but consider this as another added expense. They are OEM parts - 2 pieces that run about $175. INSTALLATION I really don't have much to offer here as I wimped out and had a body shop install and paint the bumper for me. I can describe some of the issues faced however. The bumper for the most part is a bolt on part. Rotary Extreme developed the injection mold using a new OEM bumper. Installation consistes basically of removing the old bumper, drilling the approriate holes in the new bumper, swapping over the aluminum rebar pieces from the old bumper to the new bumper, and enlarging the openings in the bumper reinforcement to accommodate the larger turn signal lenses, and then mounting the new bumper. 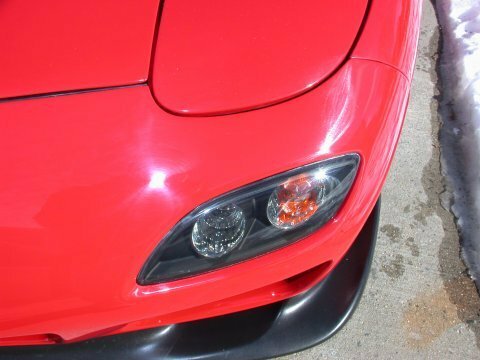 Of course accessories like the new turn signals, lip spoiler, and undertray are also installed. Only two areas may provide difficulties. Enlarging the holes in the bumper reinforcement can be tedious - enlarge holes, put the bumper on, does it fit, no, remove bumper, enlarge holes some more, mount bumper, does it fit, etc. Or you can be lazy and just hack of the entire ends of the bumper reinforcement. I instructed my body shop not to do this. The other issue is with the Aluminum rebar. there are three pieces, two infornt of the headlight buckets and the large piece that runs along the leading between the headlights. The pieces are riveted to the bumper. The rivets must be drilled out and the rebar removed and reinstalled on the new bumper. Easy, right? Well not so fast. Seems as if the new bumper urethane is tad thicker than the old OEM bumper. This may or may not leave enough clearence to refit the aluminum rebar to the new bumper. My body shop was able to refit the rubber seal but not the aluminum rebar. I might have a go at fitting it myself later but for now the bumper looks good and is not in any danger of flying off the car so I'll leave well enough alone. I do have some minor concerns with the fitment which may or may not be specifci to me alone. The fitment is good but not perfect. I believe this again to be a question of the thickness of the urethane used on the new bumper. This causes some minor misalignment around the headlight buckets. 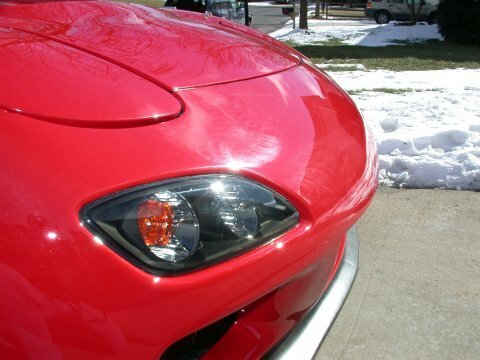 Note in the pictures below the drivers side gaps around the headlight is perfect whereas the passenger side is off by about an 1/8 inch. Not significant but noticable. Also my painter was not happy with the finish of the bumper. Extensive "wavyness" around the area where the license plate frame was removed required quite a bit of effort to fix before painting. He admitted he could have applied paint as it was but he said he would not have been happy with the result. This may vary from bumper to bumper and I admit some of the "wavyness" could have been made worse during shipment. Other than these minor concerns I am very pleased with the result. THE FINISHED PRODUCT Paint and finish is as smooth as glass. It's apparent I need to do something about ducting though. A bit of droop in front of the headlights but side seam looks great.